I got my dry sockets packed twice already, then why is the pain not going down? 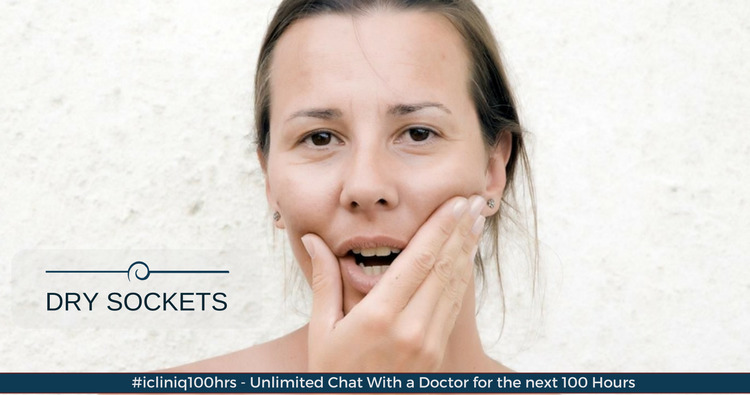 iCliniq › Ask a doctor online › Answers › Dentistry › Dry Socket › I got my dry sockets packed twice already, then why is the pain not going down? Q. I got my dry sockets packed twice already, then why is the pain not going down? Answered by Dr. Pallavi Srivastava and medically reviewed by iCliniq medical review team. I had four teeth extracted a week ago, two on top and two on the bottom. I did not get numb at all, so I felt it all. I was diagnosed with a dry socket on the bottom. The dentist that I went to packed it twice now, after 4 to 5 days. As the extracted teeth were adjacent teeth, so when he packed them, the packing was connected. The packing that was on the top of the gum connecting the two holes ate the bone in between the two extracted teeth. So, I called the dentist, and his nurse said it is normal. She said that the dentist might have done it while suturing the extraction. But it was not there after he extracted. What could this be and what should I do? It is not getting any better, and the pain is getting worse as days pass. No other dentist will see me because it is his work, and not theirs. • What treatment can be done to cure sore throat? • How to prevent bleeding on brushing? • My teeth are very yellow. How can I remove yellowness from teeth and make them white? I have gone through your query. Dry socket after extraction is caused due to the blood clot getting dislodged from the extraction socket. So ideally, the dry socket should be curetted, which means it should be cleaned and irrigated with medicine, and obtundent dressing must be placed. This is what your dentist did. The brown discharge or paste is the dressing. It will take around a week to 15 days for the pain to subside. You should go for regular dressings and maintain that area clean. Food lodgement in the socket can again cause infection and give more trouble. It is fine if the dressing is connected. I suggest using Betadine mouthwash twice a day to help in healing. Betadine should be diluted with equal amount of water, and after rinsing with it, you should not drink water for at least 20 minutes. I drank povidone-iodine mouthwash by mistake. Is my health at risk? Why do I have bad breath in spite of flossing and using mouthwash? My teeth are yellow.Is scaling only a temporary process to clean the teeth?